Tours started today for the first time during the Trump administration. 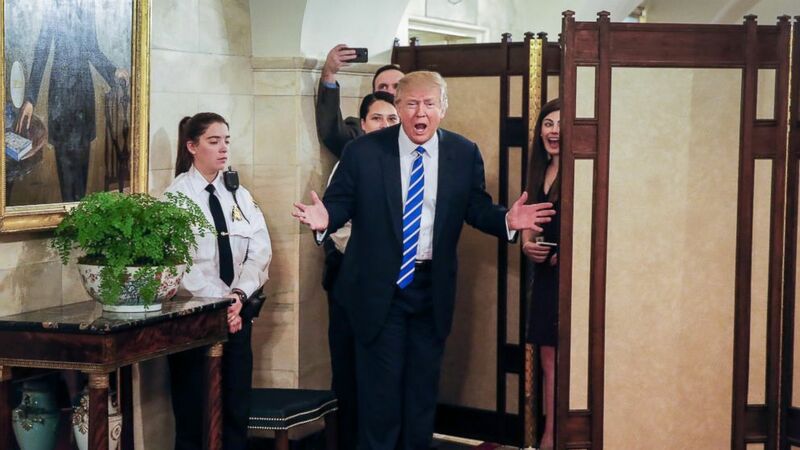 President Trump surprised a group of tourists visiting the White House this morning on one of the first public tours of the presidential mansion since Trump took office. Cheers broke out from many of the visitors when the president emerged from behind a screen on the first floor of the White House residence, standing nearby a portrait of former First Lady Hillary Clinton that hangs in the hallway. (Erik S. Lesser/EPA) President Donald Trump greets people on a public tour of the White House in Washington, March 7, 2017. The president motioned to a group children gathered in the front of the gathered tour group, but only one boy -- 10-year-old Jack Cornish from Birmingham, Alabama -- actually walked up to the president and posed for a photo. “Work hard everybody, work hard,” the president then said, pointing to the group of children, before retreating behind the screen. White House aide Cliff Sims tweeted video from the president's perspective when he surprised the group. Several weeks passed between the time that President Trump took office and the White House Visitor's Office reopened the doors of 1600 Pennsylvania Avenue to public tours. First Lady Melania Trump announced on Feb. 14 that tours would begin again on March 7. "I am excited to reopen the White House to the hundreds of thousands of visitors who come each year," Mrs. Trump said in a statement. "The White House is a remarkable and historic site and we are excited to share its beauty and history. I am committed to the restoration and preservation of our Nation's most recognizable landmark." The White House said in a statement that public tours can be requested through congressional officials. The 45-minute self-guided tours are available for several hours Tuesday through Saturday. Several people in the tour group that the president surprised told a pool reporter present that they had requested tickets in December from their congressional offices and found out last week that they had been given tickets.